When we think of flooding, we typically think of standing water that follows heavy, summer rainfall. But as recent events across the Midwest remind us, flood events aren’t specific to one season. In summer, a portion of stormwater runoff infiltrates the ground and other pervious surfaces, which helps manage flows. In spring, frozen ground impedes stormwater infiltration, leading to higher volumes of runoff. Clarkson says two inches of rainfall in June may produce 50 or 60 percent runoff. On the other hand, the same amount of rain in February or March may almost all end up as runoff. “A combination of snowmelt, frozen ground, and spring rain is the perfect storm for flooding, because the volume of runoff compounds,” adds Clarkson. The situation Clarkson describes is what’s unfolding in many Midwest states this spring, where between one and three inches of rain fell during a powerful bomb cyclone. Historic spring flooding is now widespread, leading to casualties and billions of dollars in damage to transportation infrastructure, crops, livestock, and other assets. The U.S. Army Corps of Engineers recently reported 30 levee breaches south of Council Bluffs, and the National Oceanic and Atmospheric Administration (NOAA) predicts flood impacts may continue to get worse. “Every bit of the regional watershed is producing runoff, so there’s far more runoff than you’d typically see with your average rain event,” says Clarkson. While urban systems are typically able to capture and convey spring runoff, drainage ways and natural flow paths such as rivers and streams, struggle to accommodate the heavy volume of runoff, which leads to flooding. Areas and flow paths further down in a watershed are particularly vulnerable. 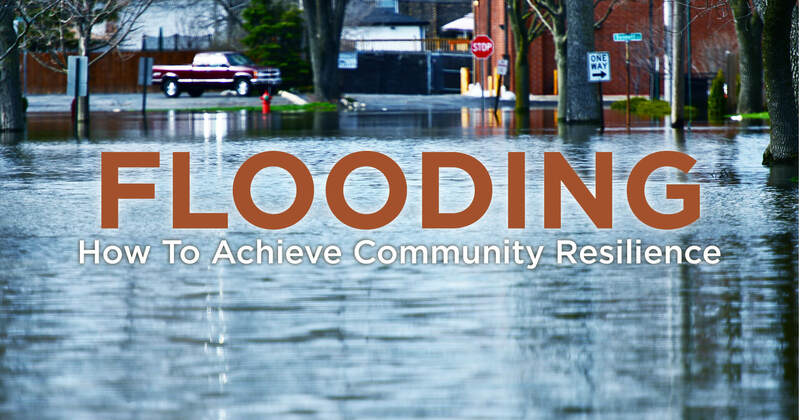 So what can your community do to protect itself from the powerful impacts of spring flooding? Floodplains are low-lying areas that are more likely to flood when runoff volume exceeds the capacity of rivers, lakes, and streams. The closer you are to a floodplain, the higher the risk. Floodplain maps are available through FEMA, but additional info is often helpful to community planning and flood mitigation efforts. One of the most common methods used by the Snyder & Associates team is hydrologic and hydraulic modeling, which provides a way to learn more about potential flood impacts and what’s at risk. Together, the information these models provides helps engineers and community leaders gain a deeper understanding of potential flood impacts and what’s at risk to guide informed community decision making. Armed with a knowledge of runoff volume and flow, there may be opportunities to improve stormwater management, which begins with an analysis of all stormwater facilities and structures. Comparing how stormwater flows and how the structures currently in place are performing helps identify where there are shortfalls now and where others might occur in the future. Clarkson says one of the best options to manage runoff are stormwater detention basins. Also known as retention basins or wet ponds, these structures are designed to collect and hold runoff that may otherwise cause flooding or erosion. “In terms of stormwater management, you’re more limited in spring. When the ground is frozen, we have to rely on physical structures to control runoff flow that’s coming off the land,” he says. By capturing and releasing runoff at a slower rate, detention basins help protect the immediate surrounding area as well as neighbors downstream in a watershed. Due to the cost involved with the permitting, design, and construction of stormwater detention basins and other infrastructure improvements, Land says they’re often long-term initiatives that are achieved through Capital Improvement Planning. Utilizing models and knowledge of historically impacted properties, Clarkson and the Snyder & Associates water resources team can also help communities identify homes and other properties for strategic buyouts. In these instances, our team of dedicated real estate and right-of-way acquisition specialists that are skilled in negotiations may expedite the process. “Reoccurring flood events can be costly and dangerous for property owners, as well as the community and state. Removing high-risk properties from frequent flood paths through voluntary buyouts helps relieve the burden on residents and can be less expensive to the community than large infrastructure improvements,” explains Land. Properties purchased by a community provide opportunities for parks, green spaces, and other public spaces that improve the local quality of life. More importantly, they can also be used to create stormwater detention basins or other improvements that attenuate runoff flow in the area and watershed. Whether it’s helping a community understand the floodplain impacts of new land development or evaluating current flood impacts to determine potential infrastructure improvements, Clarkson says planning for long-term community resiliency is crucial. He points to the 2017 climate report, which predicts that extreme storm events will grow by 10 to 15 percent by the turn of the century, if not sooner. “We’re experiencing different weather patterns, and we must take that into consideration to help communities respond and adapt accordingly,” he says. Historically, Clarkson says planning for stormwater management and infrastructure has been based on data gathered over the past 100 years. Despite more data being gathered every year, effective planning involves more than what we already know. Planning based on solely on what’s occurred in the past doesn’t properly prepare communities for what’s ahead.